In the early 1990s research interest expanded to include the effects of soy on cancer prevention, especially the prevention of breast and prostate cancer. Today, research on soy and health focuses on a wide range of areas including bone health, cognitive function, menopausal symptoms, and ischemic stroke. There is also interest in understanding how soy protein affects body composition, body weight, lean tissue accretion, sarcopenia and non-alcoholic fatty liver disease. Clinical intervention studies are important for evaluating relationships of soy consumption to easily measured endpoints such as blood cholesterol, hot flash frequency, and bone mineral density. However, much of our understanding about the relationship between soy consumption and health comes from observational studies. Prospective epidemiologic studies are best able to identify associations between soy consumption and clinically important endpoints such as heart attacks and fractures. The main limitation of these types of studies is their inability to establish cause and effect relationships. An additional challenge in utilizing these studies to investigate the effects of soyfoods is that these foods are consumed in only small amounts in most non-Asian populations. For this reason, epidemiologic insight into the health effects of soy comes mainly from Asian studies. An advantage to Asian studies is that most report a wide range of soy intake among the participants. For example, in one analysis from the Shanghai Women’s Health Study (N=45,694), daily mean soy protein intake was 8.8 ± 6.3 grams.2 Approximately 2% of the cohort consumed at least 25 grams per day whereas about 9% consumed less than 2.5 grams per day. Another advantage of Asian studies is that correlations between soy and favorable health outcomes are less likely to be due to a “healthy user” effect since soyfoods are a traditional part of the diet. In contrast, non-Asians who regularly consume soyfoods may be more likely to engage in other healthful habits. Epidemiologic studies among non-Asian populations that provide meaningful insight into the health effects of soy include the Adventist Health Study-2 (AHS-2)4 and the Oxford arm of the European Prospective Investigation into Cancer (EPIC-Oxford).5 Soy intake among the 40% of Seventh-day Adventists who are vegetarians is comparable to intakes in many Asian countries. The EPIC-Oxford oversampled for vegetarians providing a study population that regularly consumes soyfoods. Other Western cohorts also include sizable numbers of vegetarians. For example, approximately 10% of a Dutch cohort was categorized as vegetarian although their soy intake was low.6 One advantage of the AHS-2 is that Seventh-day Adventists are homogenous regarding a number of lifestyle practices. Therefore, the healthy user effect is less likely to be a confounding factor in this cohort. Numerous other studies from Europe and the United States that do not include large numbers of regular soyfood consumers have analyzed the relationship between soy intake and a variety of health outcomes. Because daily soy intake is so low (isoflavone intake is typically less than 2 mg per day in the highest intake group whereas 1 cup of soymilk provides about 25 mg of isoflavones), these studies do not provide meaningful answers to questions about soyfoods and health. Clinical studies suggest that when statistically significant correlations are found in response to such low intakes, they are unlikely to have a causal basis. 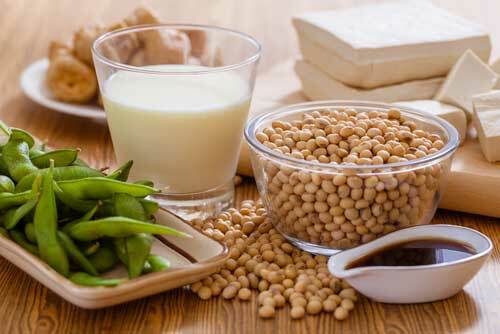 The FDA set 25 grams of soy protein per day as the threshold intake for cholesterol reduction. Therefore, epidemiologic studies focusing on cholesterol reduction in populations with average intakes of 1 gram of soy protein per day are of little value. At the present time, meaningful insight into the health effects of soy consumption can come only from clinical studies or from epidemiologic investigations of Asian populations and western populations that include large numbers of people who regularly consume soyfoods. Yang G, Shu XO, Jin F, et al. Longitudinal study of soy food intake and blood pressure among middle-aged and elderly Chinese women. Am J Clin Nutr. 2005;81(5):1012-7. Setchell KD, Clerici C. Equol: history, chemistry, and formation. J Nutr. 2010;140(7):1355S-62S. Rizzo NS, Jaceldo-Siegl K, Sabate J, Fraser GE. Nutrient profiles of vegetarian and nonvegetarian dietary patterns. J Acad Nutr Diet. 2013;113(12):1610-9. Davey GK, Spencer EA, Appleby PN, Allen NE, Knox KH, Key TJ. EPIC-Oxford: lifestyle characteristics and nutrient intakes in a cohort of 33 883 meat-eaters and 31 546 non meat-eaters in the UK. Public Health Nutr. 2003;6(3):259-69. Gilsing AM, Weijenberg MP, Goldbohm RA, Dagnelie PC, van den Brandt PA, Schouten LJ. Vegetarianism, low meat consumption and the risk of lung, postmenopausal breast and prostate cancer in a population-based cohort study. Eur J Clin Nutr. 2016.